I used to be zipper-phobic. I coveted many things with zippers such as zippered pouches, zippered purses and the like, but somehow I couldn't get over my fear of actually making something with a zipper. Then I finally challenged myself to just try, and I made a zippered pouch. Here's how you can make a zippered pouch. I typically make zippered pouches to hold something, like a notebook. Be sure to include the thickness of the notebook in your calculations. Here, my sketchbook is 6-1/4" x 9 and it is 1" thick, so I will make my pouch 10-1/2" x 12" (roughly 3" bigger). Add 1/2" seam allowances to your dimensions and cut the front and back. Using my measurements, I'll need a front and back piece that measures 11" x 12-1/2". You can piece the front and back if you want. Here, I decided to cut a top piece 3-1/2" x 12-1/2" and a bottom piece 8" x 12-1/2". 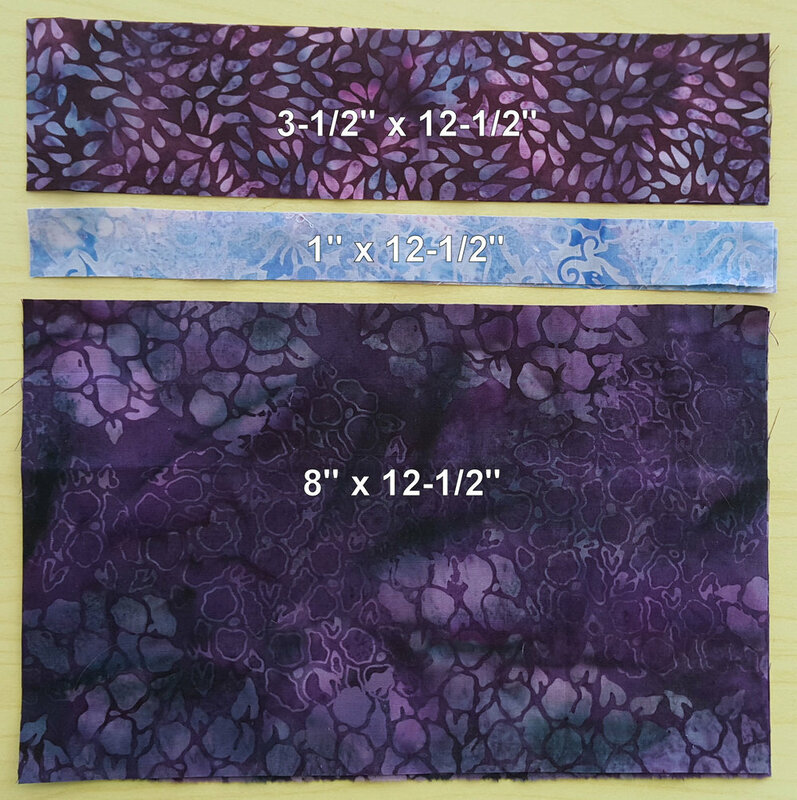 When I sew them together using 1/4" seam allowances, I'll end up with a piece that's 11" x 12-1/2". I also decided to add a flange between the top and bottom pieces, so I cut it 1" x 12-1/2". I pressed the flange in half, and placed it between the top and bottom pieces, then sewed them together. I made a front and back piece this way. 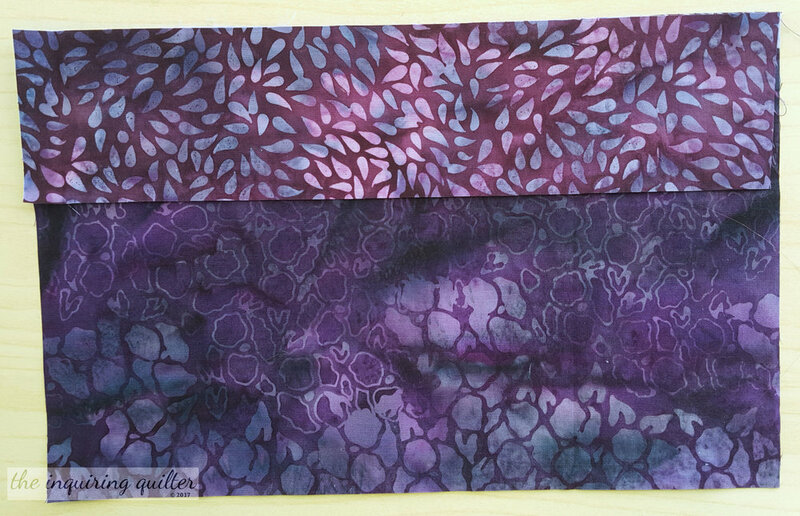 If you want back your front and back pouch pieces with fusible fleece. Cut the fleece the same size as your front and back pieces (in this case, 11" x 12-1/2") and fuse them to the wrong side of your front and back pieces. 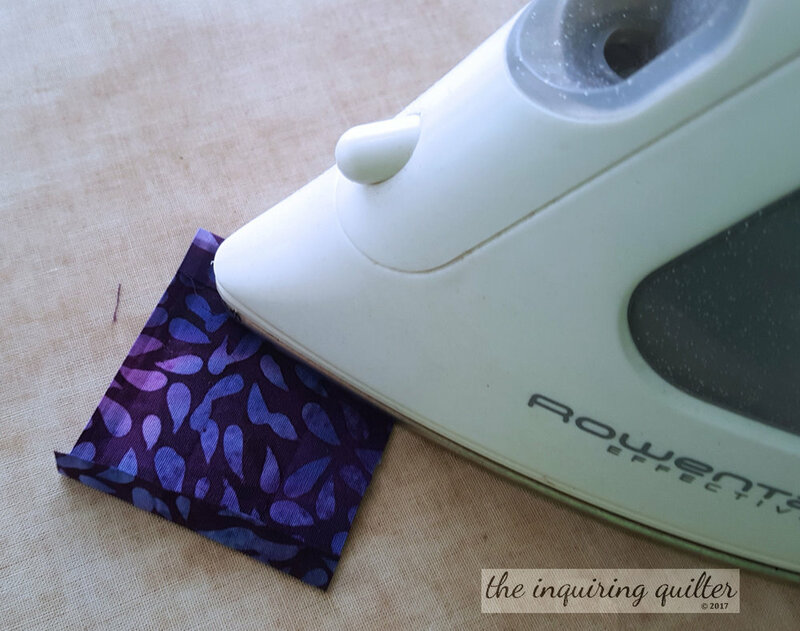 Cut lining fabric for your pouch this same size--11" x 12-1/2". Lay Front, right side up, on your work table. Place the zipper, right side down, on top of Front. The top of the zipper should be about 3/4" from the left edge of the Front. Bend the tab of the zipper back at a 90 degree angle as shown. Instead of pinning the zipper in place, I use mini clips. Place the Lining on top, right side down. Pin or clip all the layers together. Press the Front back, away from the zipper. Lay the Back on your work table, right side up. Lay the Front on top, right side down. The top end of the zipper(the zipper pull) should be to your right. Place the Lining on top, right side down. Pin or clip all the pieces together. Sew along the edge of the zipper and as before, stop about 1" from the end and move the zipper out of the way before continuing to the end of the seam. 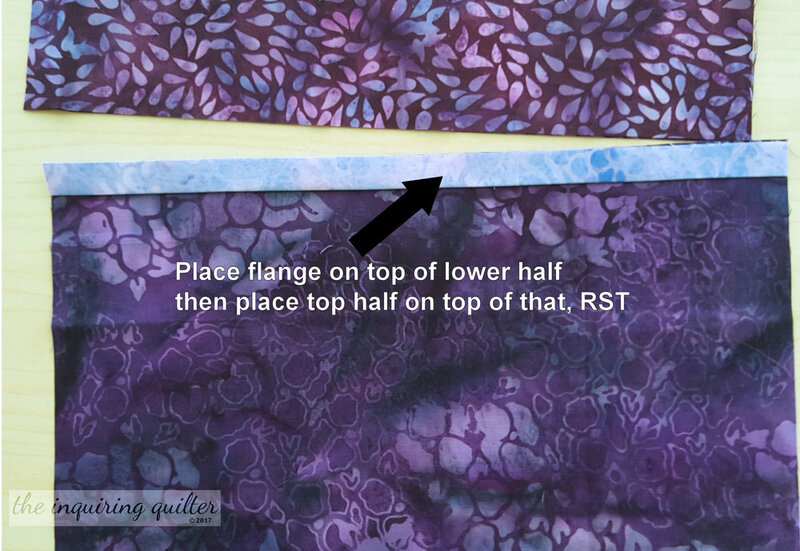 Be sure to backstitch at the beginning and end of the seam. Press away from the zipper. Unzip the zipper at least halfway so you can turn the pouch right side out later on. Fold both sides out, away from the zipper, so that right sides are facing. Pin or clip the two Lining pieces together. Pin or clip the Front and Back together. 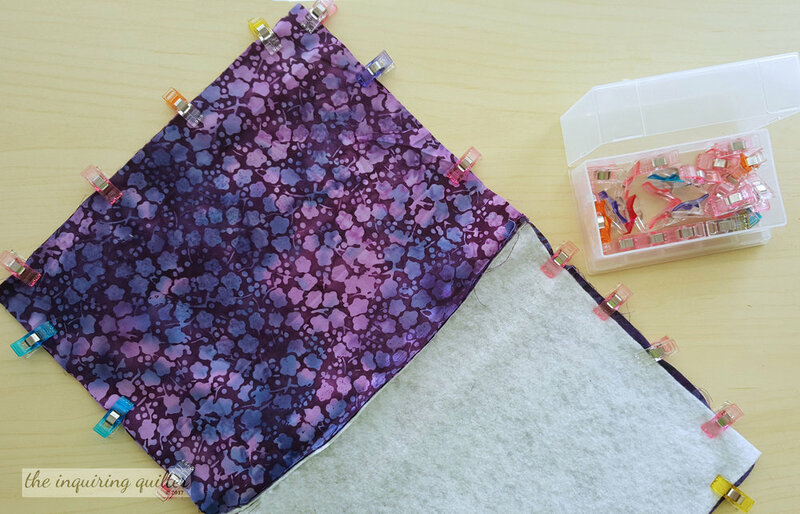 Sew around the perimeter of the pouch, leaving a 6" opening in the lining so you can turn the pouch right sides out. Yep, you need both the zipper unzipped at least halfway, and an opening in the Lining in order to be able to turn this pouch right side out after sewing. Clip the corners. Turn the pouch right side out. Poke out the corners using a knitting needle or other blunt point. 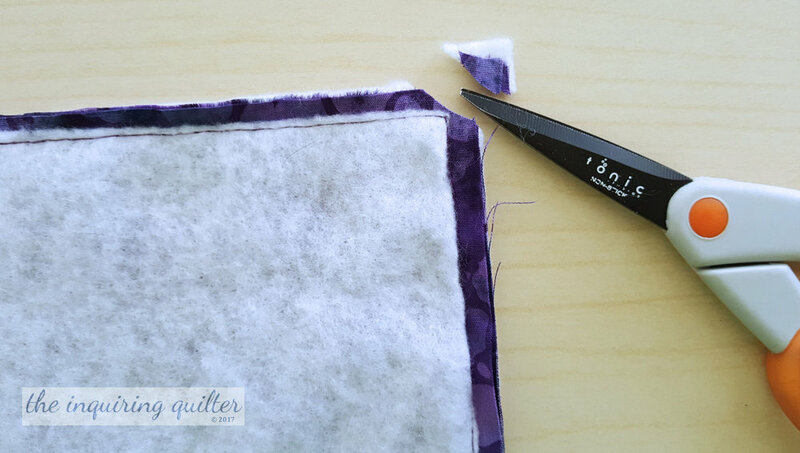 Fold under the seam allowances at the opening in the lining, then sew it closed. Cut a 2" x 3" piece of fabric to finish the zipper end. Turn under the short ends a tiny bit and press. Turn the long ends in towards the center and press. Press in half. Fold over the zipper end and clip or pin in place. Sew the end of the zipper tab closed. Yippee! You're done. Enjoy your new zippered pouch.